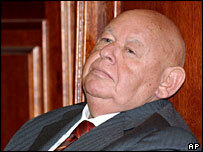 One of Poland's best known newspaper editors has been fined $6,500 (£3,457) for ridiculing Pope John Paul II. A court in Warsaw found Jerzy Urban guilty of insulting a head of state by writing a satirical article on the eve of the pontiff's 2002 visit to Poland. Mr Urban, 71, said he was exercising the right to free expression. Earlier, the press freedom group Reporters without Borders said a prosecution would set a "dangerous precedent" for an EU state. In the early 1980s Mr Urban was spokesman for the last communist government of Poland, which cracked down on the Solidarity freedom movement. He is now better known as the editor-in-chief of the weekly newspaper Nie - "No" in English. In his article, titled Walking Sadomasochism, Mr Urban referred to the Pope's frailty, describing him as "the Brezhnev of the Vatican" and an "impotent old man". When published ahead of the Polish-born Pope's last visit to his homeland in August 2002 it provoked numerous complaints. "The court has no doubts that intending to ridicule the church, Jerzy Urban ridiculed and derided the pope," the verdict said, according to the Associated Press. Opponents of Mr Urban, who attended the trial, shouted "too little" when the fine was announced, the agency reports. Prosecutors had requested a 10-month suspended prison sentence. The BBC's Adam Easton in Warsaw says the Pope's standing among Poles is so high that almost any public criticism of the Pope is taboo.